Finding a destination for a 3-generation trip with my in-laws had been a challenge, but when I suggested Montreal they immediately said yes. 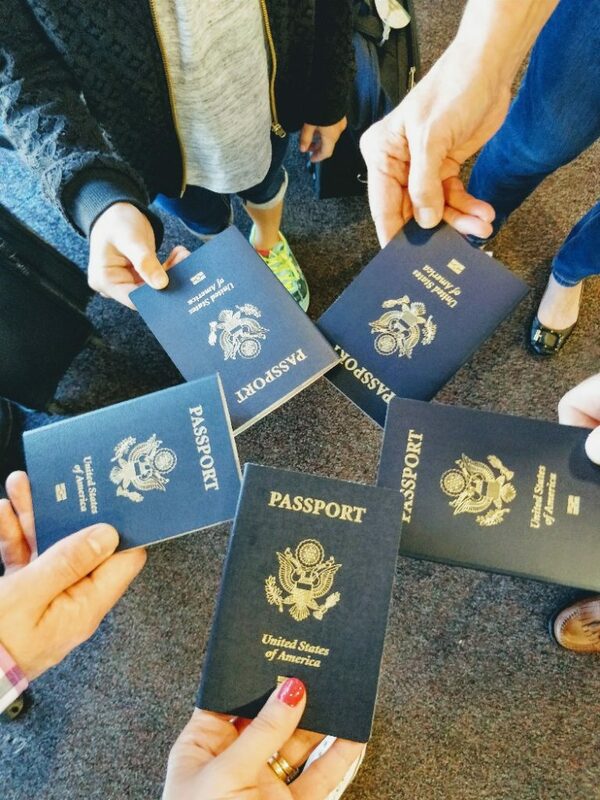 Because it was the first time Elizabeth, Mimi, and Grandad were traveling together I wanted to make this trip extra special. I immediately got to work researching and planning. 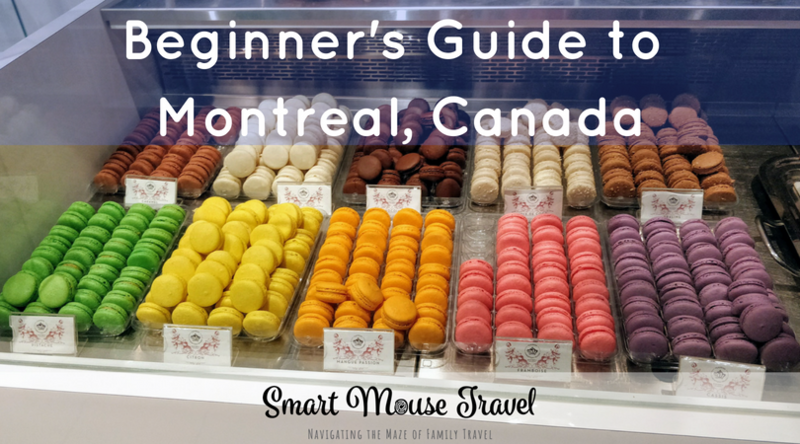 This Beginner’s Guide To Montreal will give you ideas on what to see, where to eat, how to get around the city, and all about our amazing hotel. 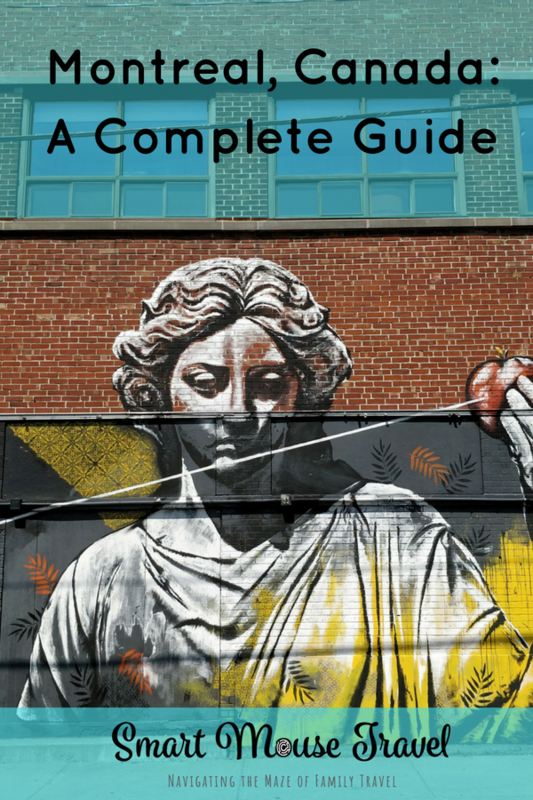 All the information in this guide is based on what we loved during our trip (which means I am not including everything we did). First a disclaimer: People raved that Montreal is like visiting Europe without the long flight. Having been abroad I didn’t feel that was the case. However, Montreal was a beautiful, clean, and charming city that we all absolutely loved. Although not the little Europe I was expecting, it did get me thinking about a lot of the challenges of traveling outside of the United States. I was reminded how important it is to learn basic phrases in the primary language (although most people in Montreal speak French and English), how much fun it is to try new cuisine (poutine – be still my heart! ), and the beauty of open air food markets as a few examples. We chose Old Montreal as our base because the narrow cobblestone streets and classic architecture is so different from home. In addition, this area is very walk-able, has lots of popular sights, and many places to eat. 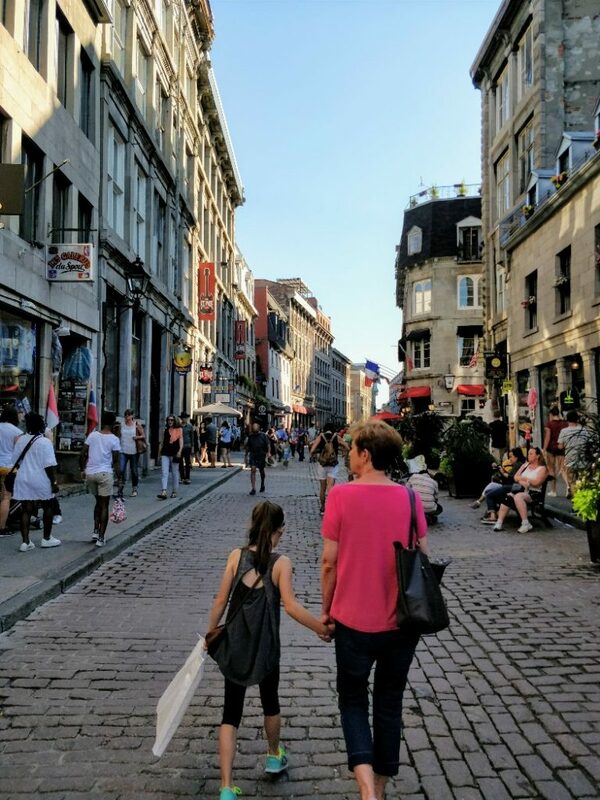 Since Old Montreal is full of historic buildings, finding accommodations to suit multiple families (or even a large family) proved challenging. 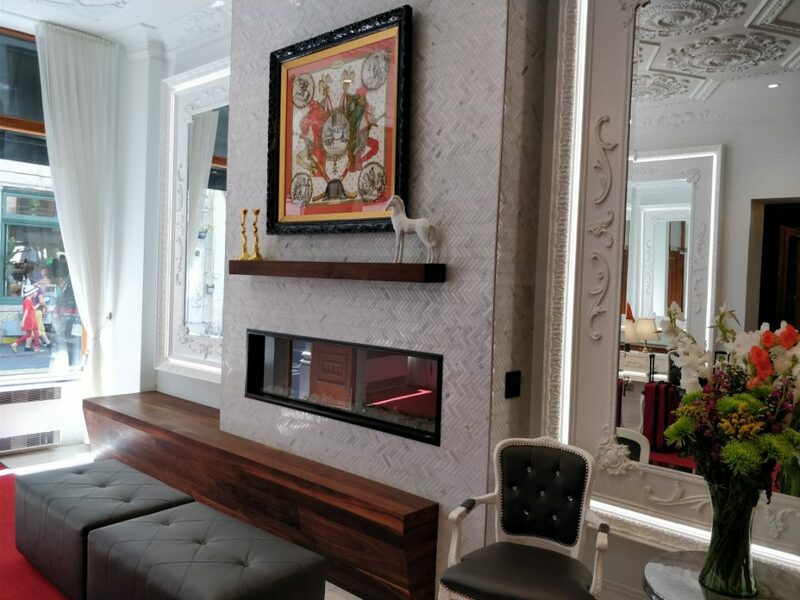 We ended up booking at Hôtel Bonaparte because it was well reviewed and had a suite option. What a wonderful hotel with amazing staff! I highly recommend Hôtel Bonaparte for your visit to Montreal. There are 30 rooms and one suite in this perfectly located and updated building from 1886. Hôtel Bonaparte is near many sights (for example Notre-Dame Basilica, Old Port and Pointe-à-Callière) and only a short walk to the Métro. We stayed in the Prestige Suite during our trip. This suite has a small entrance foyer that leads into two separate areas, each with locking doors. One side is a dedicated bedroom with an en suite bathroom and on the other side of the foyer is a separate living area (and a second bathroom). This living area is equipped with a murphy bed to provide a second sleeping area. The living room/second bedroom in the Prestige Suite also contained a mini fridge and access to a balcony overlooking Notre-Dame Basilica. We spent a lot of time out on the balcony enjoying the summer weather and views. 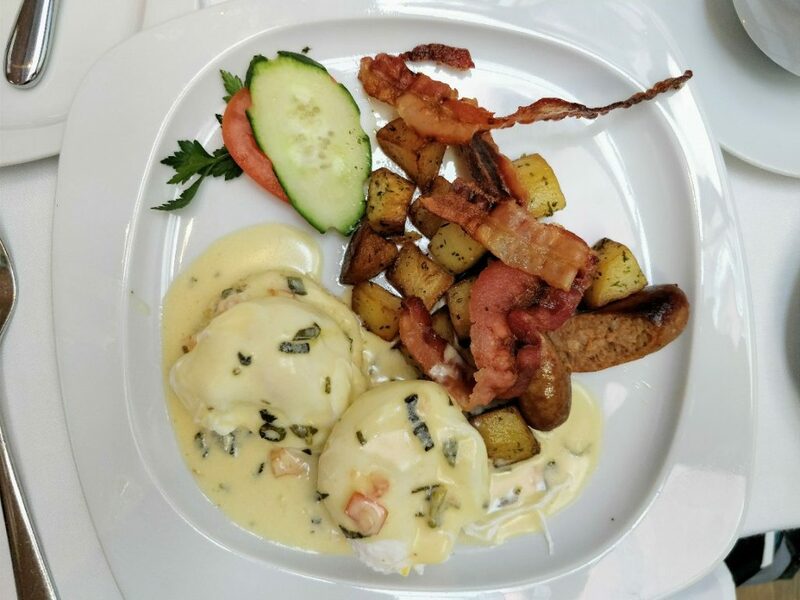 Your stay includes a full breakfast at the on-site restaurant, Restaurant Bonaparte. For breakfast you choose from a special 3-course menu with ample choices. Everyone in our group agreed the breakfast was delicious. The sage cream poached eggs were my absolute favorite. The level of service at Hôtel Bonaparte was excellent. From helping us arrange transportation from the airport to the hotel, to giving directions or just providing interesting facts about Montreal, the staff exceeded all of our expectations (especially Luc and Anne-Marie). This was our first stop in Montreal. Pointe-à-Callière is an extremely difficult to describe archaeological museum in Old Montreal. Built over 3 different historic Montreal sites, Pointe-à-Callière allows you to see real archaeological remnants of Montreal’s first settlers. It also teaches about the changes that have taken place in the city over the last 500 years. I highly recommend you first watch the multimedia presentation Yours Truly, Montreal in the theater behind the ticket counter. This 18-minute movie (with projections on the floor and walls) provides many language options via headsets found at your seat. This presentation gives a great overview of Montreal from the Ice Age until modern times. From the theater you exit into the archaeological sites. There are many interactive and educational displays in English and French throughout the museum. Two of our favorite activities were walking through Montreal’s first sewer (don’t worry, it’s clean) and the Fort Ville-Marie area. Fort Ville-Marie was the first French outpost in North America. Part of this area had a unique display. A TV with video and tubes of neon lights tell the story of Fort Ville-Marie and several events that took place at this historic site. The neon tubes show the missing pieces of the building and made history feel more tangible than just reading a plaque. 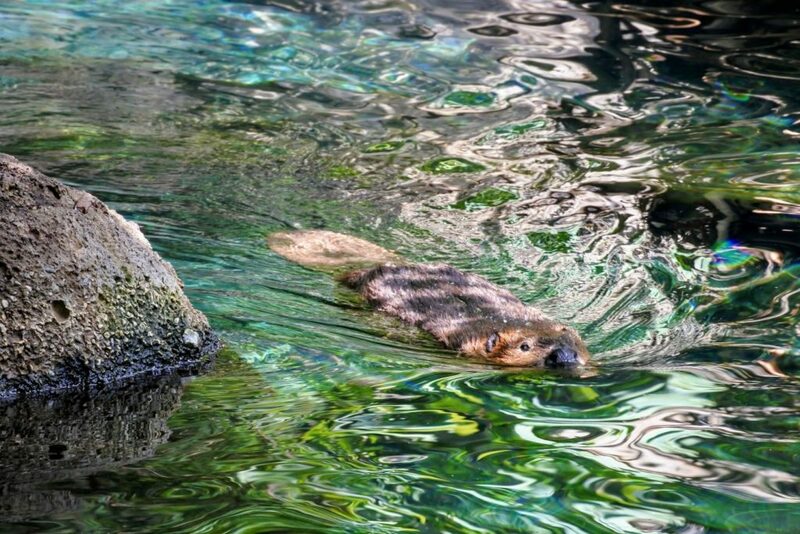 Espace Pour La Vie (Space for Life) is a large museum campus that includes four amazing natural science museums in Montreal: the Biodôme, Insectarium, Botanical Garden and Rio Tinto Alcan Planetarium. Espace Pour La Vie was a beautiful and educational stop that had something for everyone in our group (despite the wide age range). We were granted complimentary access to the Biodôme, Insectarium and Botanical Garden in exchange for an honest review. Find the in-depth review here. 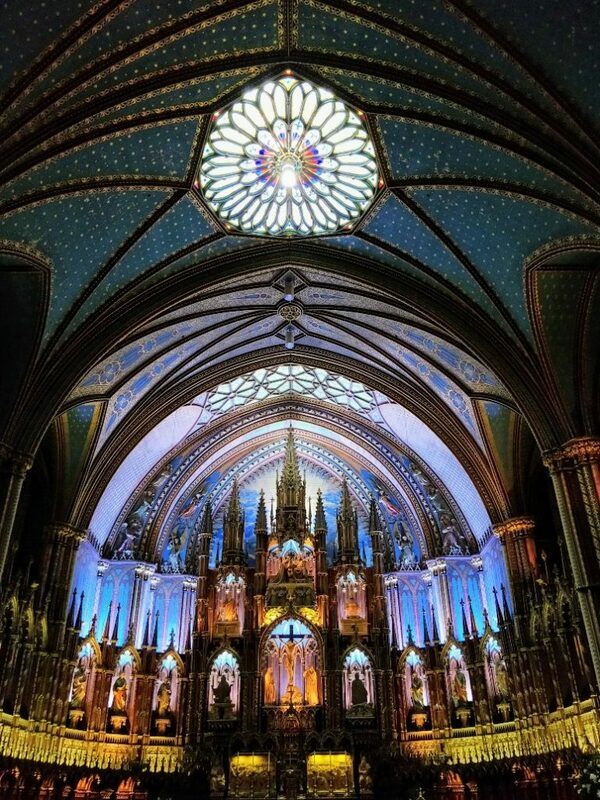 On every best of Montreal list you find Notre-Dame Basilica (and mine is no different). Since we were staying within a few minute walk to the Basilica we opted to go first thing in the morning. This turned out to be wise. We entered the Basilica at 9 am and by the time we left at 9:45 am the crowds had increased dramatically. We also saw that lines outside Notre-Dame Basilica were often incredibly long most afternoons. Notre-Dame Basilica was one of the most gorgeously maintained cathedrals I have ever seen. The detail and colors were so beautiful. I’m sad that as lovely as my pictures turned out they are a pale version of seeing it in person. 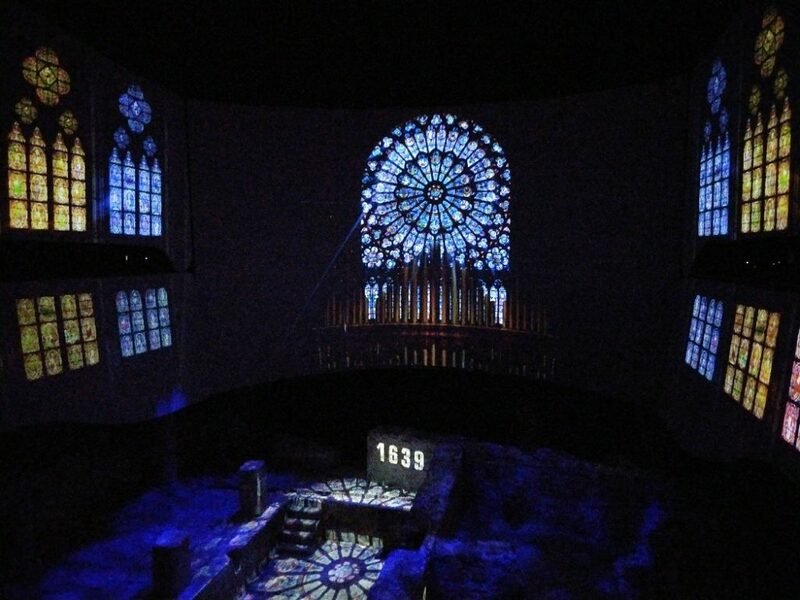 Cité Mémoire is a unique art installation in Old Montreal, made up of 22 tableau (or short audio/visual scenes). These tableau locations can be found by using the Cité Mémoire mobile app. Make sure to download the app before your trip. 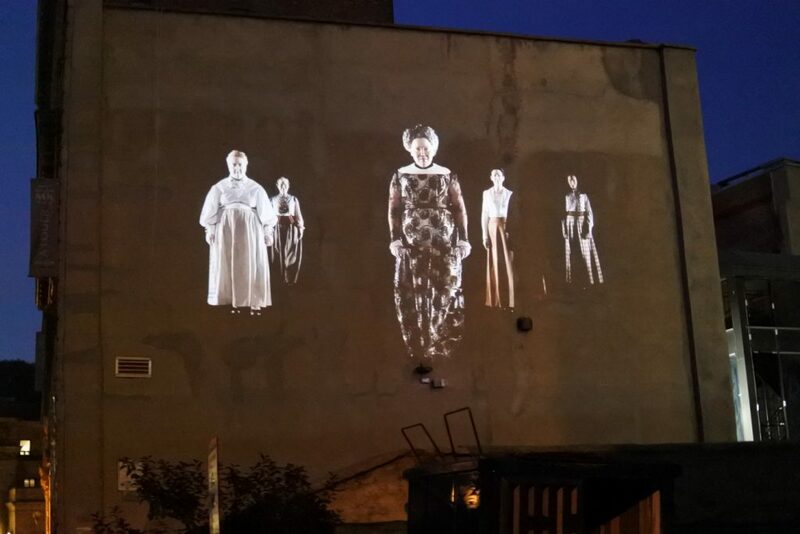 The sides of buildings, alleyways and trees act as screens for the video projections of Cité Mémoire. The audio comes through in the language of your choice via the mobile app. To hear the audio, you must connect to the Cité Mémoire WiFi access points. There are many vignettes as part of Cité Mémoire. Some are about how Montreal was built, some about the social injustices of the past, and some about prominent groups in Montreal history. All of the adults loved this multimedia historical presentation. However, Elizabeth is a very empathetic soul and many of the topics deeply upset her (to be honest some upset me, too). 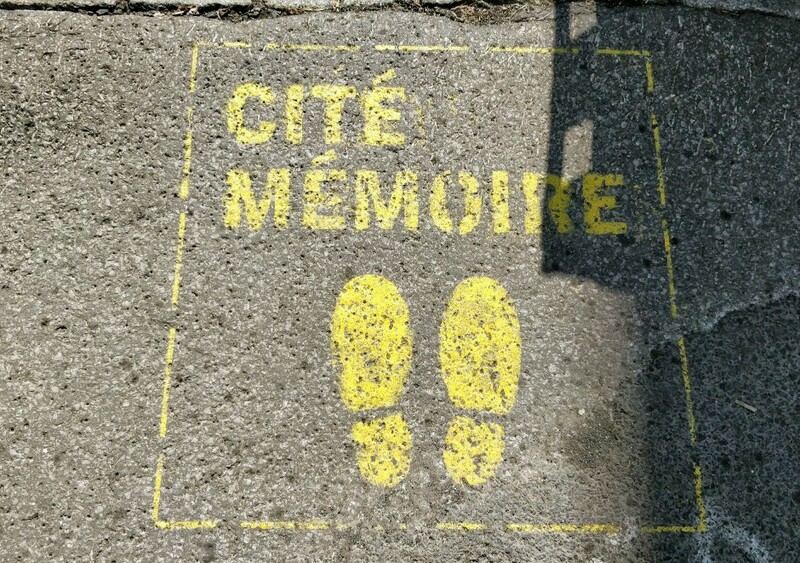 I recommend you research each of the vignettes and use your judgement when sharing Cité Mémoire with your kids. The stories brought to life via video and audio made for an amazing experience. Although Elizabeth was upset by some of the topics, Cité Mémoire provided us the opportunity to have some meaningful conversations. Marché Jean-Talon (Jean Talon Market) is an immense open-air market available year round in the Little Italy neighborhood of Montreal. 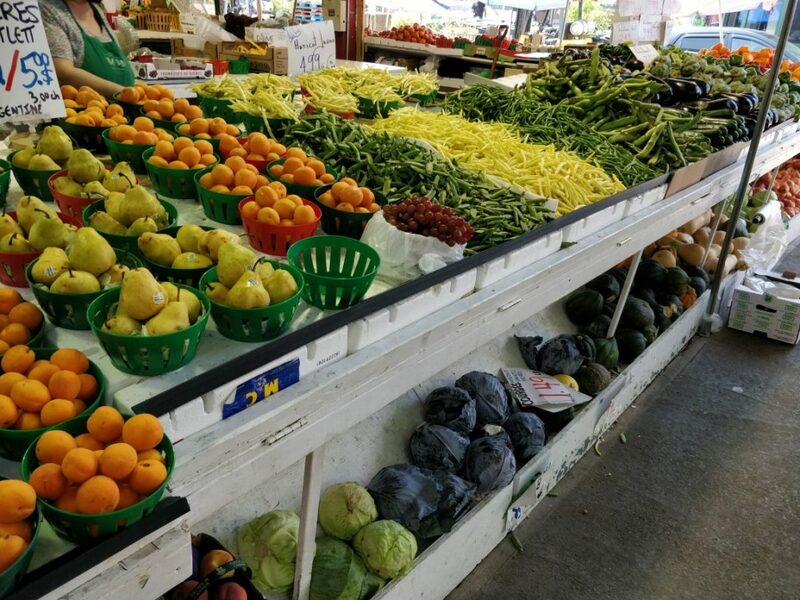 Here you will find stalls of fresh produce, maple syrup, meat, seafood, flowers, and handmade items. There are also several places to grab a quick bite to eat when you’ve made yourself hungry looking at all of the beautiful food. Although we bought very little from the Jean Talon Market, it was a unique experience. I was so inspired by the fresh ingredients I wanted to borrow someone’s kitchen to whip up a quick meal! Located about a mile away from Marché Jean-Talon you will find Jarry Park. This huge green space is the former baseball stadium for the Montreal Expos. 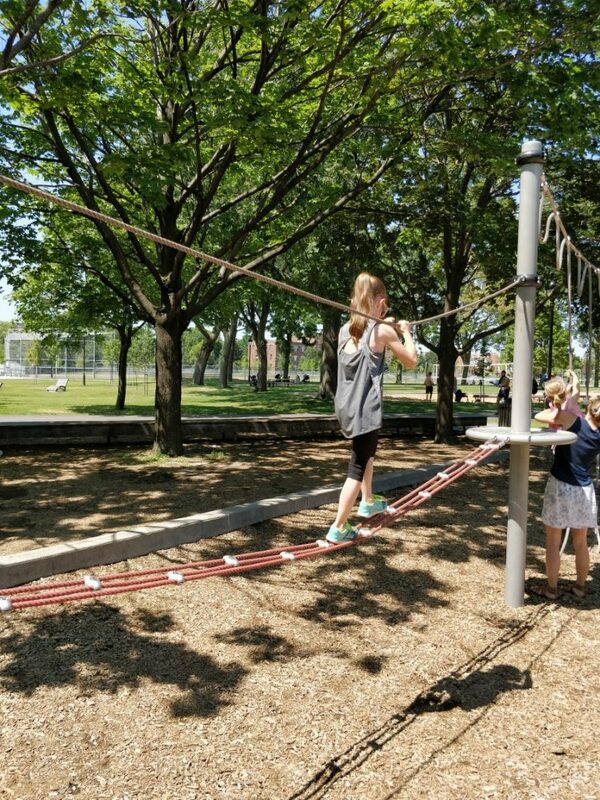 After spending the morning walking around the market I thought Elizabeth deserved some time in a playground, and the one at Jarry Park was well reviewed. Once we found the park (pro tip: it is located near the police station and public wading pool off Boulevard Saint-Laurent) the adults grabbed a picnic table in the shade to watch her play. There were many children there, and Elizabeth was able to find a new friend in spite of not being able to communicate at all! The best part of the park were the rope courses that allow kids to climb and tightrope walk around the park. Place Jacques-Cartier is a bustling “town square” found just outside of the Old Port. When we visited over the summer the streets were closed to car traffic, and many artists and street vendors had booths set up. Elizabeth found her souvenir for the trip in Place Jacques-Cartier. She chose a wintry photo of Notre-Dame-de-Bon-Secours chapel which will be framed for her room. Places to eat and drink are on either side of the square. Many had an outdoor terrace where you could watch the passersby while you sipped your drink. We also saw street performers do a fun show while we wandered this area. Although not as popular as Notre-Dame Basilica this church is worth the short walk from the Old Port of Montreal. Notre-Dame-de-Bon-Secours Chapel is often referred to as the “Sailors’ Church” because sailors came here to pray and make offerings as thanks for safe passage. 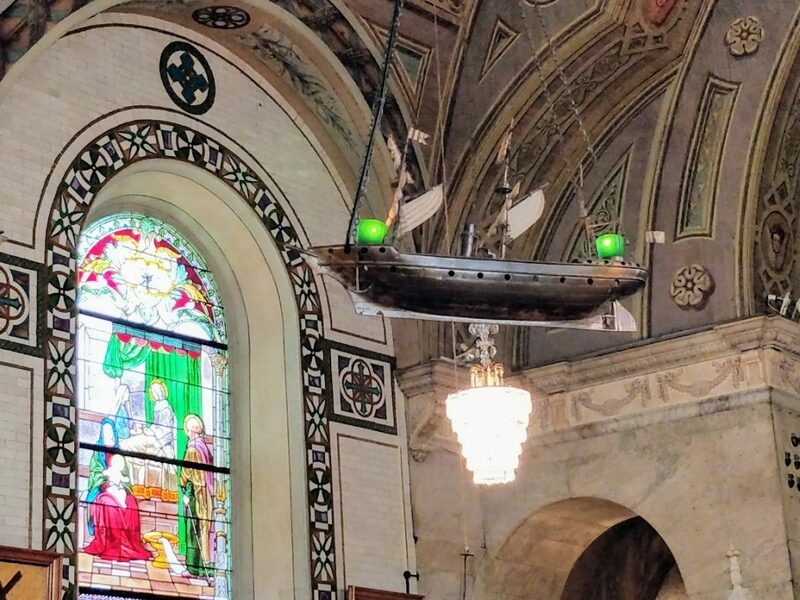 Model ships hang throughout the chapel as a nod to this history. There is no admission fee to enter the chapel, but donations are appreciated. Fabrik – Creativity Factory – This area was one of Elizabeth’s favorite exhibits. Fabrik has six challenges where you are provided a problem and supplies to engineer a solution. We could have stayed in this area all day. The project we worked on was how to protect a ball dropped from a height so that the lights would not be triggered. 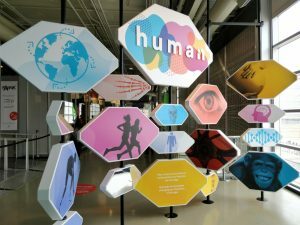 Human – The other permanent exhibit we enjoyed was Human. Human helps us to admire what the human body can do and how we evolve over time. The interactive portion I will always remember best is the one regarding hearing loss with age. In this area you push a button and a tone is emitted from a speaker. 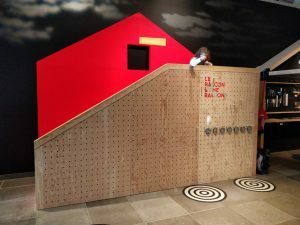 There are certain ranges of hearing that are lost as we age and this exhibit was a (mean) reminder that I have already lost some hearing capabilities. Elizabeth was a bit too gleeful when she realized the rest of us couldn’t hear some of the tones. 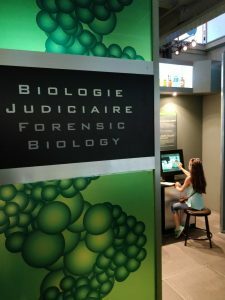 CSI: The Experience – This was a temporary exhibit when we visited and has now left Montreal. It was fabulous. We were challenged to examine crime scenes, process evidence and solve the crime. If you ever find this exhibit near you check it out. My only warning is that although watered down these are still crimes where (pretend) people die. This was fine for my 8-year-old, but some would find it too macabre. Le Bateau-Mouche – I wanted to take a day cruise along the lovely and important Saint Lawrence River during our visit to Montreal. The 60 minute cruise on Le Bateau-Mouche was a great overview of many of the sights located along the river. 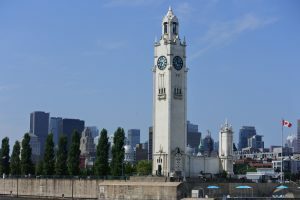 It provided glimpses of Ile Sainte Helene (which has several tourist stops such as the Biosphere and La Ronde amusement park), the clock tower and North America’s oldest brewery, Molson, to name a few. You can choose to sit on the open air deck or go inside the air conditioned viewing areas. The tour is given by a guide who alternates sharing facts in English and French. 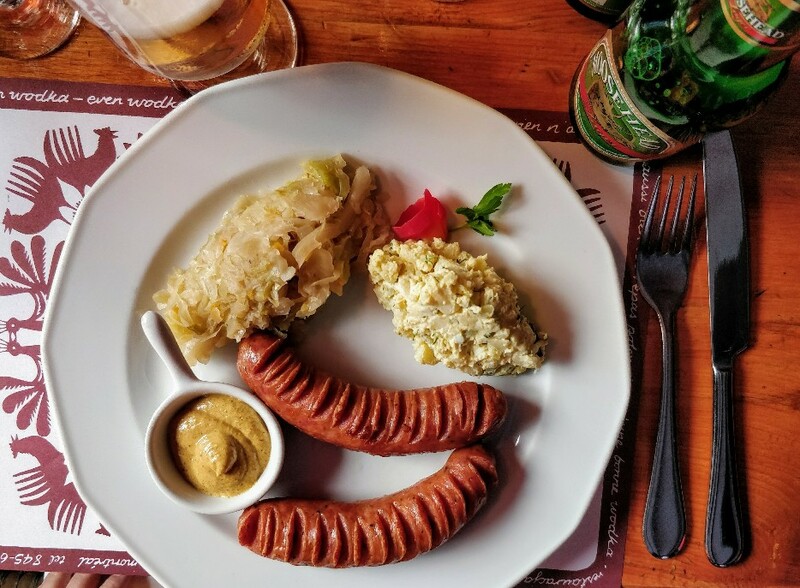 This adorable spot tucked into a building in Old Montreal serves some amazing Polish food. In fact, Cafe Stash was so good we ate dinner here twice! Pierogis, stroganoff, and kielbasa were all a hit with our group. And I made my mom proud when she heard I ate my sauerkraut and beet salad, too. 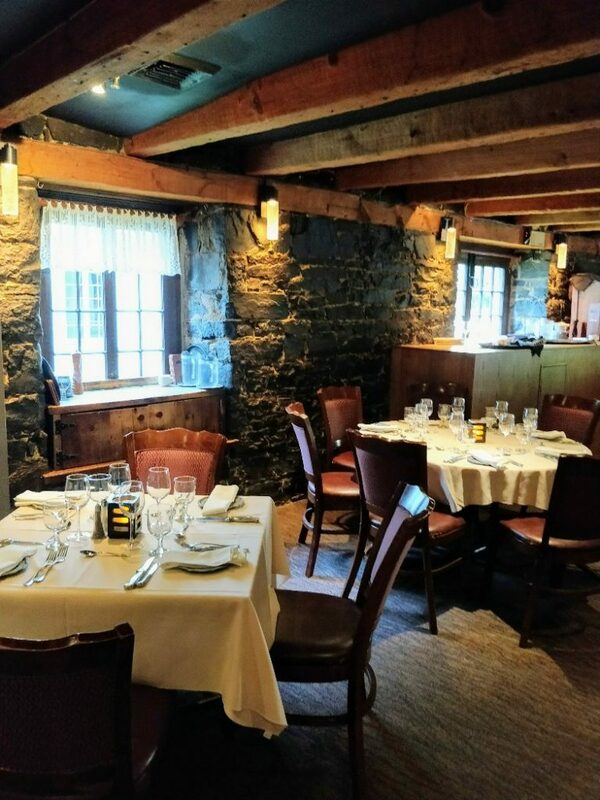 Gibby’s is a charming steakhouse located in a former 18th century stable in Old Montreal. This was the priciest meal of our trip, but we all agreed it was well worth it. Steak, potatoes, salad and veggies made sure we left stuffed. Fortunately we did save a little room for the chocolate mint candy brought with our check. 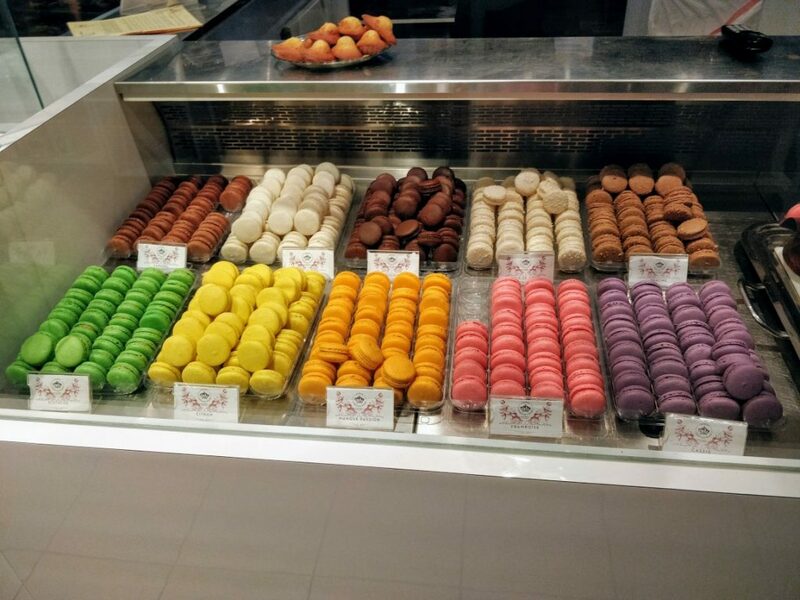 Maison Christian Faure is a renowned pastry shop in Montreal that did not disappoint. I had the most decadent chocolate cake (croustillant de pralin). Elizabeth and Mr. Smart Mouse opted for the macarons which were that perfect balance of flavor and lightness. As a bonus Elizabeth got the most amazing homemade marshmallows (which we used to make a ridiculous artisan s’more one evening). A small cafe found near Notre-Dame Basilica, Tommy Cafe has delicious coffee and treat options. I was schooled by my in-laws on Cafe Cubano (an amazing Cuban-style espresso drink) and now I am hooked. 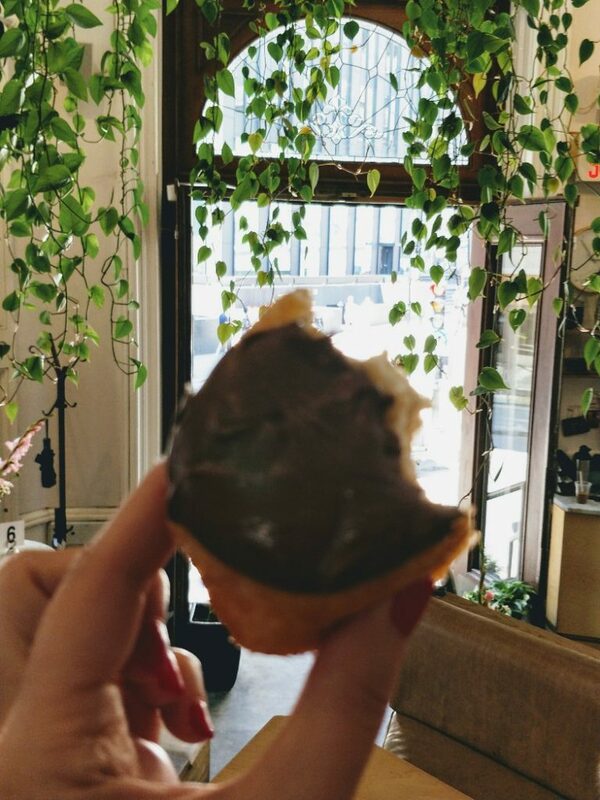 Elizabeth discovered cronuts (with Nutella on top). Tommy Cafe is a great place to grab an afternoon coffee and relax a bit. Since we stayed in Old Montreal we were able to walk to many of the above tourist attractions. For example: Notre-Dame Basilica, Pointe-à-Callière, the Old Port of Montreal and Place Jacques-Cartier were all an easy walk from Hôtel Bonaparte. For places that were further away (Espace Pour La Vie, Mile End neighborhood, Marché Jean-Talon) we used the Metro. The Montreal Metro is a clean, easy to navigate subway system. 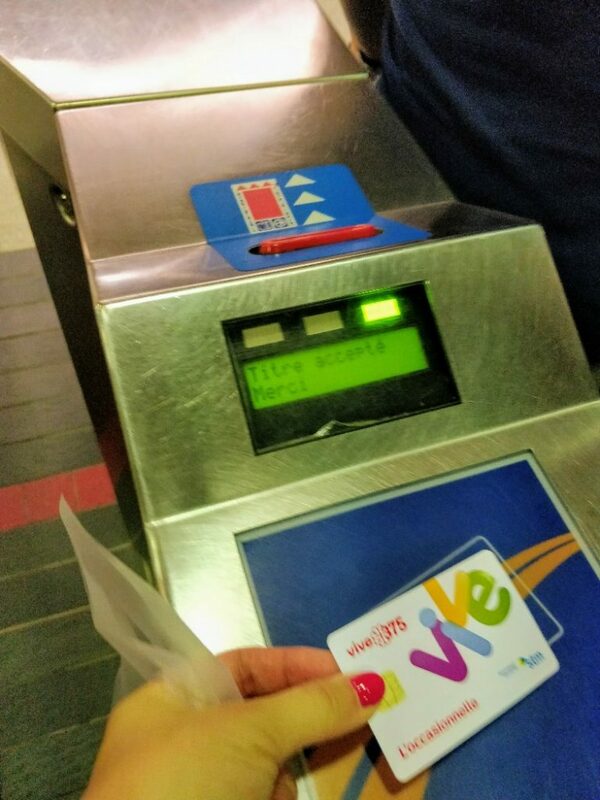 We purchased 3-day unlimited Metro passes (for CA$18 per person) which allowed us to use the Metro as often as we wanted. The pass was a very economical choice for our group, and we found the Metro easy to use. The Montreal Metro is one of the best public transport systems I have taken in my travels. We only used car transport to and from the airport. Other than that we walked or used the Metro. The staff at Hôtel Bonaparte arranged a car service to pick us up from the airport. We wanted to remain together from the airport to the hotel which required a minivan. Unfortunately, there was no guarantee a minivan cab would be available upon our arrival to the airport. This is why we splurged on a car service to the hotel (although it was only slightly more expensive than if we had taken two regular cabs). On the way back to the airport Hôtel Bonaparte arranged with a cab service to provide a minivan. As we’ve come to expect from cab drivers, the cab provided a reasonable service but tried to see what “creative” pricing he could get away with. He did not start the meter, but we knew in Montreal that there is a flat rate to the airport based on your starting point. As soon as he was reminded of that he took his fare and left. 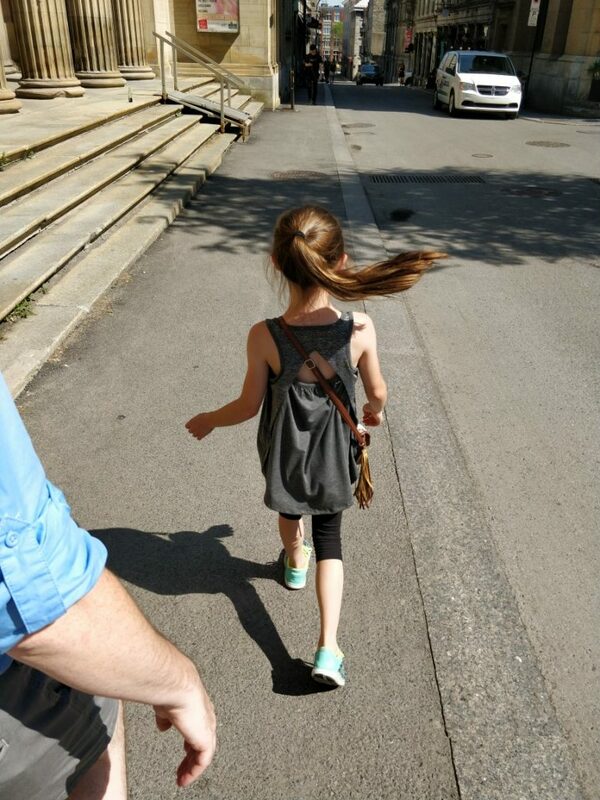 Montreal was the perfect destination for our long awaited 3-generation trip. The city is full of beautiful old architecture, amazing museums, great coffee, and easy to use public transportation. I could not believe how quiet and clean the areas we visited were despite being full of people. There were so many things left on my list of ideas I am ready for another trip back! What is your favorite place in Montreal to visit, eat or stay? Share your favorites in the comments. Other than the admission to venues in Espace Pour La Vie in exchange for an honest review I was not compensated for any other aspect of our trip. we really need to get up to Montreal. We can drive there! I think the kids would love it – oh esp those nutella cronuts! Looks like there is a lot to do! 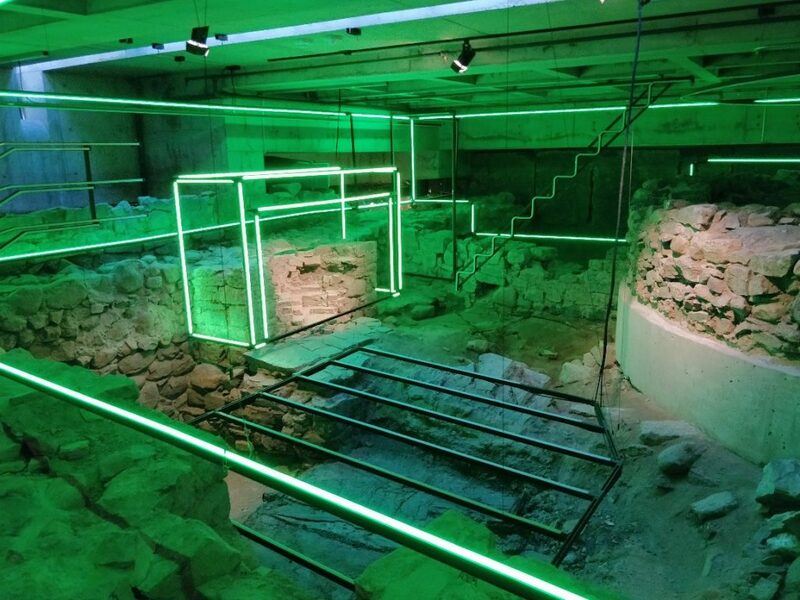 I love digital art installations like Cité Mémoire and it’s something we don’t find everywhere. Thanks for all the good tips! I am headed to a blogging conference in Montreal next spring. This detailed post will be very useful. Nicely put together. Hey! Awesome Montreal post! I recently visited and did a post myself, and it brought back so many memories. I absolutely loved the culture and vibes there. I wonder how it’d be in the winter though!